If it was going anywhere I'd say on the Brook retail park but parking and drive through would be a few problems there. If you dig a little deeper it comes up with it being located as 29 High Street but there is no number 29. Could this just be where the manager lives? A few responses from Burger King UK on its Facebook site. Hi, we don't have any information about new store openings available at present I'm afraid. 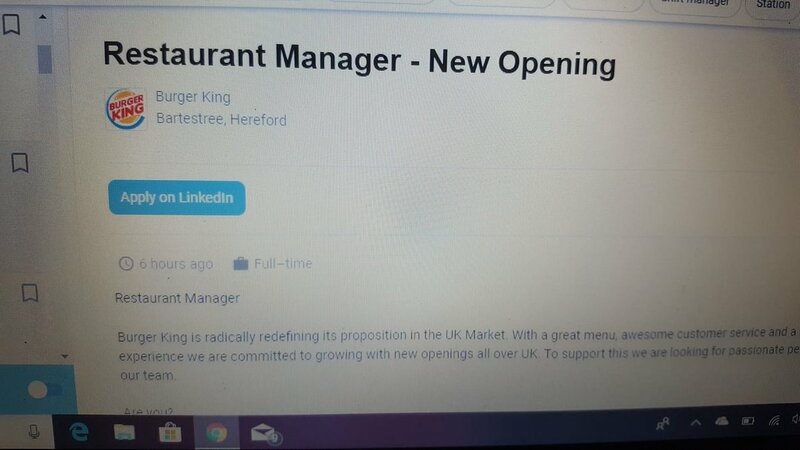 A responce from me asking if the advert was incorrect..
Hi there, it may be an independent franchisee, we don't have any details of this opening available. If you're interested in the role, we suggest you submit your details and get in touch directly. Thank you, and good luck. Sorry missing the point here but why is everybody getting so excited about a Burger King? No doubt somebody will enlighten me! Just had confirmation from website indeed who are the main advertisers for Burger King. Burger King have started a massive expansion plan in the UK looking to open a further 200 restaurants. who were BK's franchaise partners. Can somebody please answer a question of mine. Burger King say there will be 50 Full time employees yet Pepes Piri Piri say they will be employing 5 full time and 3 part time staff. It makes no difference to me apart from employment for the youngsters but why the enormous difference? Are Burger King's proposed premises 6 times larger than Pepes proposed premises. I think the property Burger King has is two buildings knocked into one.The last time I went into Pepes new gaff it was pretty small. PLANNING | ✅ Planning permission granted for Burger King to open a restaurant in the former Lakeland Unit on Commercial Street in Hereford! The outlet will open this spring. I ate 3 Burger King 'Meals' in a row earlier this week. On consecutive days. Purely on a convenience basis. As for the new Hereford location .... Hey Ho!